Not only is May National Bike Month, but May 14-18 is National Bike to Work Week and May 18 is National Bike to Work Day. These are great times to leave the car at home and take the bike to work. Sitka cyclists can take part in the National Bike Challenge, which runs from May 1 to Aug. 31. This national event is trying to get 50,000 people riding 10 million miles during the four months from May through August, and you can win prizes for participating as individuals and/or teams. There also are smart phone apps that can track your distance and record it. New this year is the inaugural National Bike to School Day on May 9, which is a chance to encourage students to develop healthy lifestyle habits such as riding a bike or walking. School districts have the opportunity to schedule special events for National Bike to School Day, and they can list them on the national site to earn pioneer status. Parents should feel free to join their children to ride to school that day. One of the highlights of National Bike Month in Sitka is the Sitka Bike Rodeo, which this year takes place from 10 a.m. to 1 p.m. at the U.S. Coast Guard-Air Station Sitka hangar. This free event teaches young riders bike safety, provides the kids with bike safety checks and more. It is sponsored by the Sitka Rotary Club and U.S. Coast Guard-Air Station Sitka. 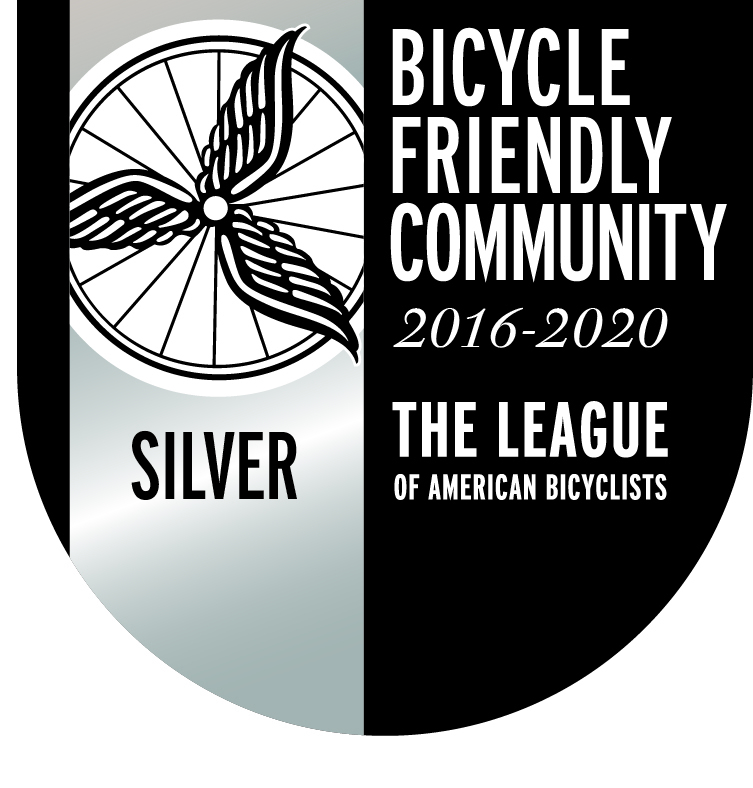 National Bike to Work Week kicks off on Monday, May 14, which is when the League of American Bicyclists will announce its next group of Bicycle Friendly Communities. Sitka submitted a renewal application in February, so this is when we should hear if Sitka maintained its bronze level status from 2008 or improved its status. Fingers crossed. Each year, Sitka hosts a National Bike to Work Week contest where people who ride their bikes to work or school on May 14-18 can stop by Yellow Jersey Cycle Shop to enter a contest to win a $100 gift certificate from the shop. The more times you ride, the greater your chances to win. 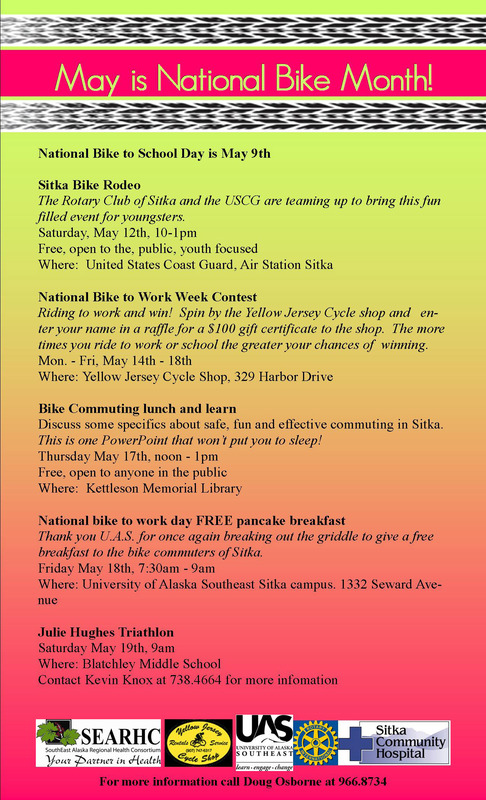 From 7:30-9 a.m. on Friday, May 18, the University of Alaska Southeast-Sitka Campus will host its annual free pancake breakfast for National Bike to Work Day. Ride your bike to the university and get free pancakes fresh off the griddle. Finally, the 28th annual Julie Hughes Triathlon takes place at 9 a.m. on Saturday, May 19, at Blatchley Middle School. This event is hosted by the Baranof Barracudas Swim Club. The triathlon features a five-mile run from Blatchley to the U.S. Coast Guard-Air Station Sitka entrance gate and back, a 12-mile bike ride from Blatchley to Starrigavan Recreation Area at the end of Halibut Point Road and back, and a 1,000-yard swim at the Blatchley Middle School swimming pool. A shorter course is available for children age 12 or younger. There is a $25 per participant entry fee for individuals and teams, and proceeds from the triathlon benefit the Sitka Cancer Survivors Society. Event registration is from 4:30-6:30 p.m. on Friday, May 18, at the Hames Athletic and Wellness Center, or from 7-8:30 a.m. Saturday before the race at Blatchley. For more information, contact Kevin Knox at 738-4664 or e-mail bbsc.sitka@gmail.com. 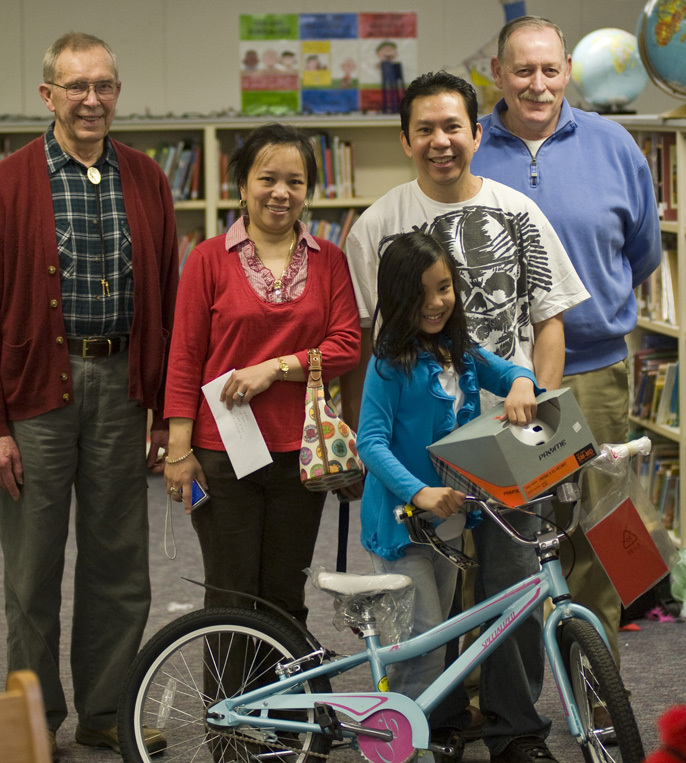 BIKE PRESENTED – Jack Ozment, left, and Ken Creamer, right, of the Sitka Mount Verstovia Masonic Lodge, present a new bicycle to Kaycee Lanza, with her mother Imelda, and father, Robert, recently at Keet Gooshi Heen Elementary School. Third grade teacher Carolyn Bekeris chose Kaycee to receive the bicycle based on the good citizenship she displayed in class. The lodge is donating one bicycle to a student in each third grade class in the school. Yellow Jersey Cycle Shop donates a helmet and lock as part of the prize. (Daily Sitka Sentinel photo by James Poulson). 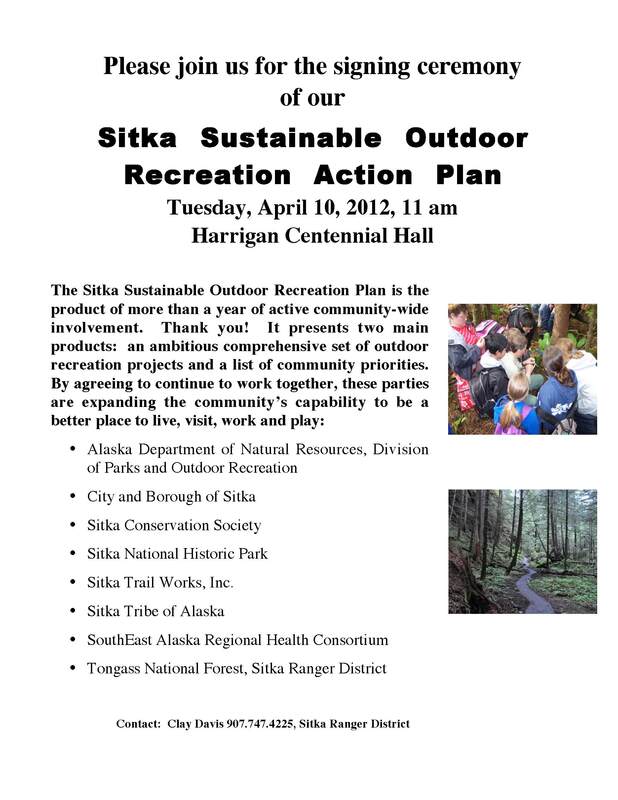 Stakeholders will gather at 11 a.m. on Tuesday, April 10, at Harrigan Centennial Hall to sign the Sitka Sustainable Outdoor Recreation Action Plan. (Editor’s note: Here is a link to a KCAW-Raven Radio story about Tuesday’s signing ceremony). This plan has been in the works for about two years, though it hit a bump in the road about a year ago. The steering committee featured a variety of stakeholders — the Tongass National Forest Sitka Ranger District, Alaska Department of Natural Resources Division of Parks and Outdoor Recreation, City and Borough of Sitka, Sitka Conservation Society, Sitka National Historical Park, Sitka Trail Works Inc., Sitka Tribe of Alaska, and the SouthEast Alaska Regional Health Consortium (SEARHC). In addition to the major agencies, there also were local outdoor-oriented businesses and individuals on the committee, and there was extensive public comment as the plan was developed. The plan provides two main products — an ambitious and comprehensive set of outdoor recreation projects, and a list of community priorities. By agreeing to continue to work together, these parties are expanding the community’s capability to be a better place to live, visit, work and play, the signing ceremony flier said. For some of the history of the process, go to http://www.outdoorsitka.com/, a site maintained by contracted facilitators Agnew::Beck Consulting. A final draft of the plan (minus signatures) is posted below as a PDF document. 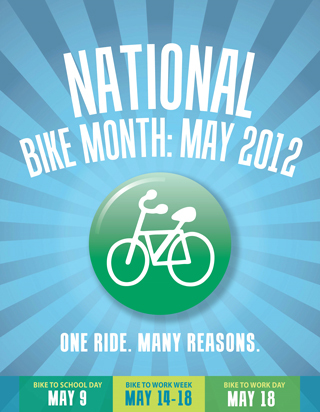 • Do you have a Sitka bike event to list in our National Bike Month calendar in May? May is National Bike Month, and Doug Osborne is compiling a list of Sitka bike events happening in May for our annual calendar. In addition to May being National Bike Month, National Bike to Work Week is May 14-18 this year and National Bike to Work Day is Friday, May 18. This year also will be the inaugural National Bike to School Day on Wednesday, May 9. In past years, events have included the Sitka Bike Rodeo (USCG and Sitka Rotary, May 12 this year), a free pancake breakfast for bike commuters on National Bike to Work Day (UAS), a bike commuter contest for National Bike to Work Week (Yellow Jersey Cycle Shop), the Julie Hughes Triathlon on May 19 this year, and a variety of lunch-and-learn seminars about bike commuting or women and biking or bike touring at Kettleson Memorial Library, SEARHC and Sitka Community Hospital. There also have been some businesses who offered discounts to people who bicycled to shop or work during this month. In other communities, events have included community bike ride, community bike/gear swap, or similar events. Unfortunately, due to limited manpower and budgets we will need someone to champion these events if they are to happen in Sitka. Another option is to have Sitka individuals and teams register for the National Bike Challenge that launches on May 1 and runs through Aug. 31, with the goal to have 50,000 cyclists ride 10 million miles. If you have any Sitka events you’d like to add to the calendar, please contact Doug Osborne at 966-8734 or doug.osborne@searhc.org.